May 27, 2011 – Radio Interview: Paul McKeever, leader, Freedom Party of Ontario was interviewed today on the Jim Richards Showgram (CFRB 1010 AM, Toronto). The topic: Paul McKeever’s costing of the Hudak PC proposal to have provincial criminal inmates collect litter in Ontario neighbourhoods at a price, to the taxpayer, of $3000.00 per inmate. On the Jim Richards Showgram, NewsTalk 1010 AM, Toronto, Paul McKeever, leader, Freedom Party of Ontario, discussed his costing of the Hudak PC proposal to have provincial criminal inmates collect litter in Ontario neighbourhoods at a price, to the taxpayer, of $3000.00 per inmate. Freedom Party receives letters on a daily basis. Party leader Paul McKeever reads all of them, and tries to respond to all of them (though he could not possibly answer all of them). In the last few days, Progressive Conservative party leader Tim Hudak announced that he would remove the debt retirement charge from Ontario electricity bills. Like his promise to make time of use billing optional, it is a proposal lifted from Freedom Party of Ontario’s far more substantive electricity plank for the 2011 provincial election; a plank that was released way back on October 12, 2010. You can read it here: http://www.freedomparty.on.ca/electricity/electricity.htm. In true Progressive Conservative style, Mr. Hudak decided to lift these planks only because his party discovered, through polling, that these Freedom Party proposals are popular. His desire to lead by following the polls (i.e., his desire to be the Follower in Chief), has – of course – also led him to lift a plank from Ontario’s socialist New Democrats, who have proposed to remove Ontario’s 8% portion of the HST from electricity bills (the NDP says they’ll make up for the $1.2B loss by taxing corporations, whereas Tim Hudak’s PCs want us all to believe that he’ll be paying for his promises by “cutting red tape” and finding “waste in the system”: we’ve all heard that ridiculous song before). May 18, 2011 – Radio Interview: Paul McKeever, leader, Freedom Party of Ontario was interviewed today on the Jim Richards Showgram (CFRB 1010 AM, Toronto). The topic: Freedom Party of Ontario’s promise to open up the LCBO and The Beer Store to competition from other stores (such as grocery stores and 24 hour convenience stores), so that Ontario has wider selection, lower prices, and greater shopping convenience. 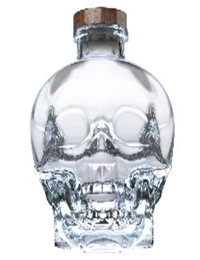 This video was released to promote the party’s 2011 election plank: Alcoholic Beverages: Wider Selection, Lower Prices, Shopping Convenience. Shopping Convenience, Wider Selection, Lower Prices. “The coming Victoria Day long weekend kicks-off a cottaging and barbecuing season in which Ontario’s adults will enjoy a wide range of wines, beers and spirits. 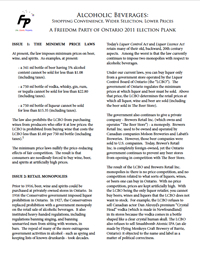 A 2011 election plank released today by Freedom Party of Ontario calls for three changes affecting the sale of alcoholic beverages in the province: wider selection, lower prices, and increased convenience…” Click here to read the full media release. 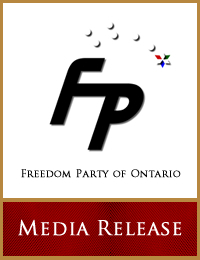 Those familiar with the Freedom Party of Ontario web site will know that the most recent Freedom Party activity of particular importance can be found on the What’s New page. Freedom Party also maintains a blog – http://www.freedomparty.on.ca/updates – containing essentially the same updates, which has the advantage that google’s blog search makes each new development searchable by date. As of today, new entries to the Freedom Party Updates blog will post, automatically, to Freedom Party of Ontario’s Facebook fan page, https://www.facebook.com/pages/Freedom-Party-of-Ontario/158045494207497?sk=wall .